The rule refers to § 619 (12 U.S.C. § 1851) of the Dodd–Frank Wall Street Reform and Consumer Protection Act. Volcker argued that speculative investment activities were one of the most influential factors contributing to the Great Recession (2007-2010). Speculative investments are those where the purchaser is only interested in price fluctuations, making a profit, and not the long-term, fundamental value of the asset. With so many bailouts of banks by the taxpayer, governments on both sides of the Atlantic introduced a series of new laws aimed at preventing the causes of the 2007-2008 financial crisis from happening again. 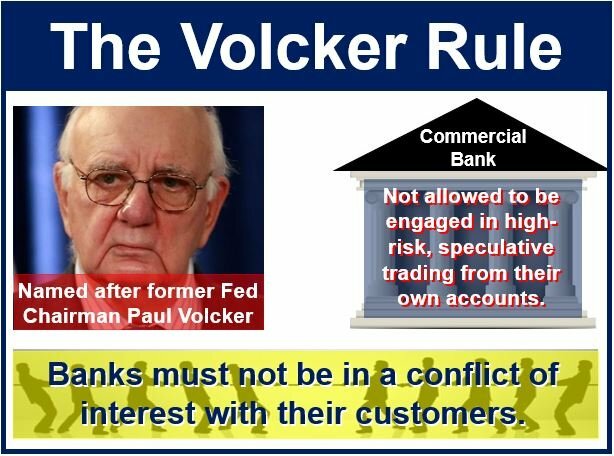 The Volcker Rule is a ban on commercial banks conducting proprietary trading, where they use deposits to trade on their own accounts. Essentially, this means that financial institutions are no longer able to use their own funds to make risky investments to generate profits. Mr. Volcker wanted to stop commercial banks from using depositors’ money to gamble in the markets. It limits a bank’s ownership and relationship of hedge funds and private equity funds, capping bank ownership in hedge funds and private equity funds at three percent. The Volcker Rule also made the Federal Reserve impose more careful requirements on systemically identified non-bank institutions engaged in risky investment activities. The Volcker Rule was first endorsed on January 21, 2010 by President Barack Obama. On February 6, 2009, Obama recruited Paul Volcker as Chairman of the President’s Economic Recovery Advisory Board. As a consequence of the rule, many financial institutions such as Goldman Sachs and JPMorgan Chase & Co. were placed under the microscope and scrutinized closely. Several Republican representatives at Congress expressed their concerns, stating that the the rule’s stipulations would have a negative effect on the competitiveness of American banks worldwide. The final rules were enacted on April 1, 2014, and by July 21, 2015, all firms were required to fully abide by the rules.